Lyft executives celebrate the company’s IPO at a party in Los Angeles. Lyft began trading on the Nasdaq today (March 29), kicking off what promises to be a big year for money-losing consumer tech startups. The second-biggest ride-hail service in the US after Uber, Lyft priced its initial public offering (IPO) at $72 per share, valuing the company at as much as $24 billion when things like restricted stock options are accounted for. The company had initially sought an IPO price of between $62 and $68 a share, but was able to increase the range after the deal reportedly filled up in the first two days of its investor roadshow. Lyft is the first of more than a dozen high-profile consumer-focused technology startups expected to complete public offerings in 2019. Food-delivery company Postmates, online mattress retailer Casper, and workplace messaging service Slack have all filed confidential paperwork for a listing with the US Securities and Exchange Commission. Zoom and Pinterest made their filings public on March 22. Uber is expected to unveil its IPO filing and begin its investor roadshow in April, meaning it could hit the public markets shortly after Lyft. Other companies rumored to be considering public offerings include Airbnb, Instacart, and WeWork. Lyft’s stock opened up 21% over its asking price at $87.24 shortly before noon US Eastern time. The day-one “pop” is common for technology startups but doesn’t always last. Snapchat parent company Snap, for example, jumped 40% out of the gate when it debuted on the New York Stock Exchange in March 2017 and ended the day at around $24. Two years later, the company’s stock price has been cut in half, currently trading at less than $11. By early afternoon, Lyft’s initial sugar high was already starting to wear off, with the stock trading around $80—an 11% gain over the IPO price. Investors in this year’s wave of IPOs will have to decide how comfortable they are betting on companies that have yet to prove they can make money. Lyft lost $911 million in 2018—on average, $1.47 per ride—and has never turned a quarterly profit. That’s despite raising nearly $5 billion in venture capital since it was founded in June 2012. 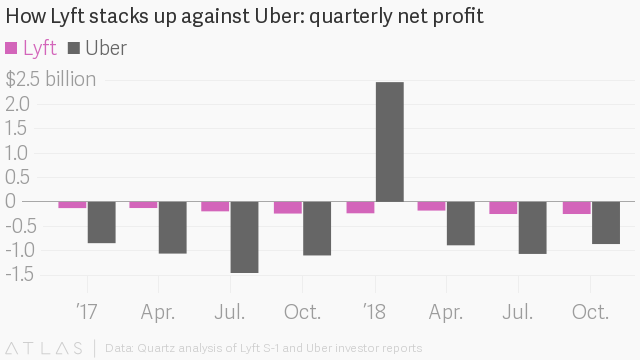 Chief Lyft rival Uber is also chronically unprofitable, turning its first and so far only quarterly profit in the first quarter of 2018 thanks to mergers with regional rivals in Russia and Southeast Asia. Uber lost a combined $2.8 billion in the other three quarters of 2018. Lyft’s losses are largely due to its costly battle for US market share with Uber. In 2018, Lyft spent $800 million on sales and marketing to attract new riders and drivers. The company spent an additional $540 million on rider, driver, and passenger incentive programs that year, which it deducted from annual revenue. It’s unclear what Lyft plans to change to reverse those losses in the near future, and Uber seems unlikely to bow out of the US. Long term, Lyft, like other companies in the ride-hail industry, is banking on mass deployment of autonomous vehicles to make its business more profitable by eliminating the main cost—the driver.